Pothole Days to start this week. Garden City - The Ada County Highway District's annual Pothole Days begins Tuesday, April 2. Every year ACHD runs this event to encourage the public to report potholes when they see them. You can report a pothole by visiting our website at www.achdidaho.org, click on the "Contact Us" tab on the home page and fill out the form. Take a picture, tell us where it is and provide any additional details that you think are helpful. ACHD crews will use that information to find the pothole and repair it quickly. Typical response time is 24 hours, but that may vary due to the large volume of requests we see during this event. 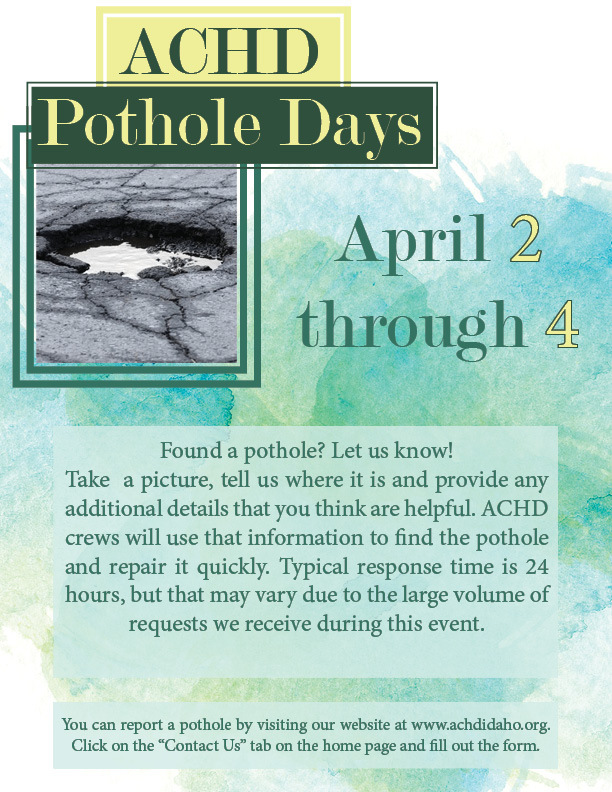 Pothole Days runs through Thursday, April 4, however you can report a pothole to us at any time.